Today's review is a little different from my typical cosmetic, beauty post. I had the opportunity to test out Nokia's newest addition to their family the N97 mini (item was temporarily loaned out then returned to the company). Today the beauty industry is so in tune with the world wide web that it's almost a requirement to have the necessary devices to keep you connected. From online blogging, to YouTube videos and Twitter...it definitely helps to have a cell phone with the right applications. If you're interested in checking out this review, click here for more! Since i'm not the most technologically adept person out there, I commissioned the BF to assist me with this review. Here goes! I really liked the size of the N97 mini. It fit right into my current phone's holster and even easier into my pocket. It's pretty lightweight and very sleek looking. The sliding screen was quite innovative and felt sturdy. The phone really feels solid in your hands! I enjoyed using the OVI store for apps. I currently use an app-less phone so the whole world apps was new and exciting. I cancelled my data plan because I didn't use it but the fact that the n97 mini was wifi enabled made it easy to surf the web and check emails on the go. The 5.0 megapixel camera was awesome. I found myself snapping pictures of everything and sending them to friends. 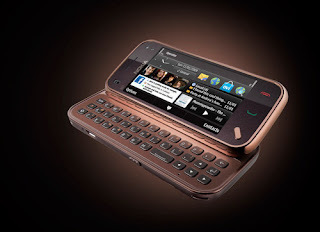 I can see myself using the n97 mini on a daily basis. With the good, there was also some bad (not much). First, the price. I know this model is new and new phones are usually an arm and a leg, but in the $400-$500 range someone would more often than not choose the latest iphone. The small size of the phone was great, until I went to use the keyboard. People's hands are different sizes but I found myself constantly hitting the wrong key when trying to type something due to the small spacing. Also, a stylus would have been nice when using the touch screen ability of the phone. Often times I resorted to using a writing pen cap. All in all, it's a great phone. Due to the hefty price, I would recommend purchasing it in about a year or so. FTC Disclosure: This product was sent to me by the company for review. I have not been paid to write this review and am not affiliated with the company. These are my honest thoughts and opinions. That is one gorgeous phone! One to think about in future phone buying. I don't know if these get you excited or not, you have probably recieved so many! But I've just given you an award on my blog! Come check it out! but I decided not to buy it because there are so many similar and good phones out there for a more reasonable price. and the fact that the keyboard is TINY and you have not stylus is crazy. I will be giving a review of it.